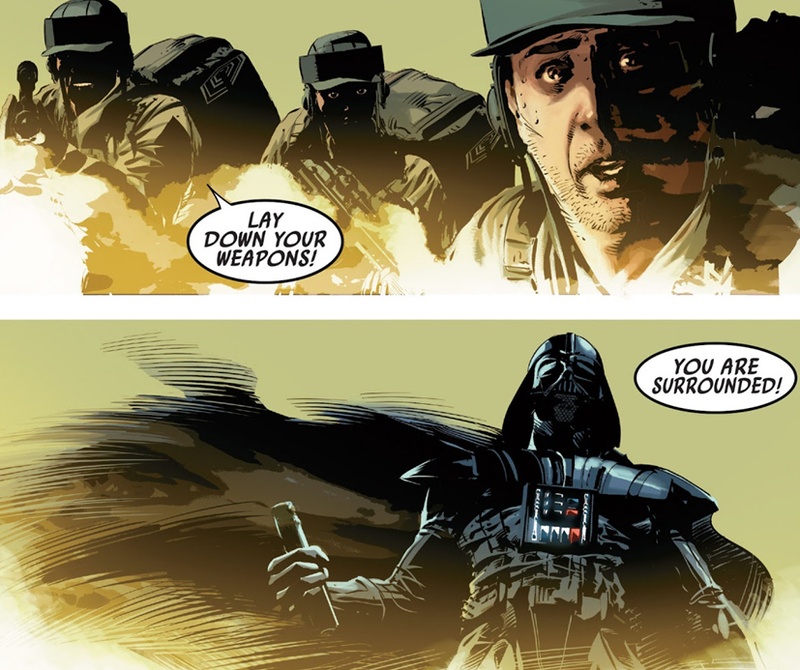 The original comic strip is from the comic book: Darth Vader Down! 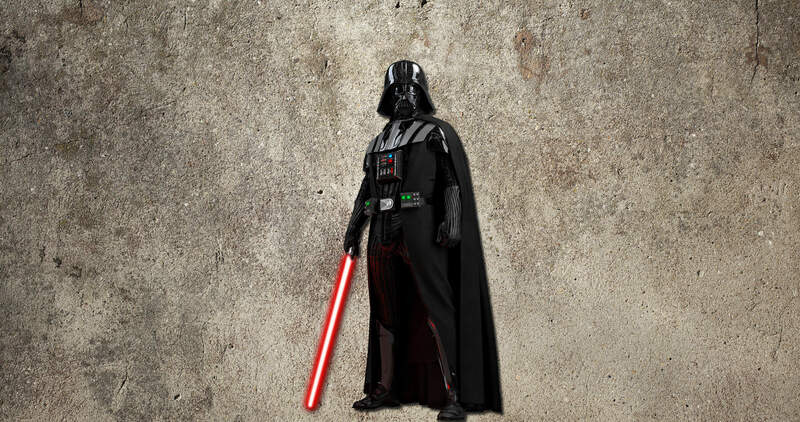 Darth Vader is, possibly, one of the silver screens most iconic characters. A supreme villain with a hint of goodness, I fell head over heels with him after watching A New Hope in the cinema. My father and I walked across the street to a toy store and I walked home with a Darth Vader Kenner toy and a Stormtrooper to keep him company. My road towards the Dark Side began and many decades later, I still follow the villain side of every story and film I read or watch. 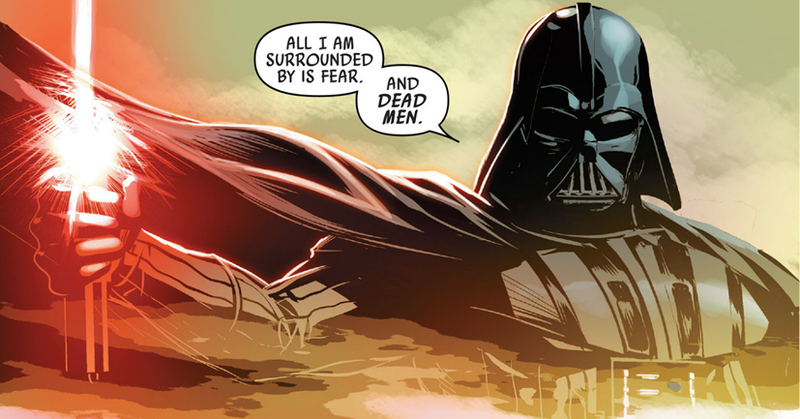 But as Star Wars is my all time geek fandom, Vader and Co always are at the top of my interest list. 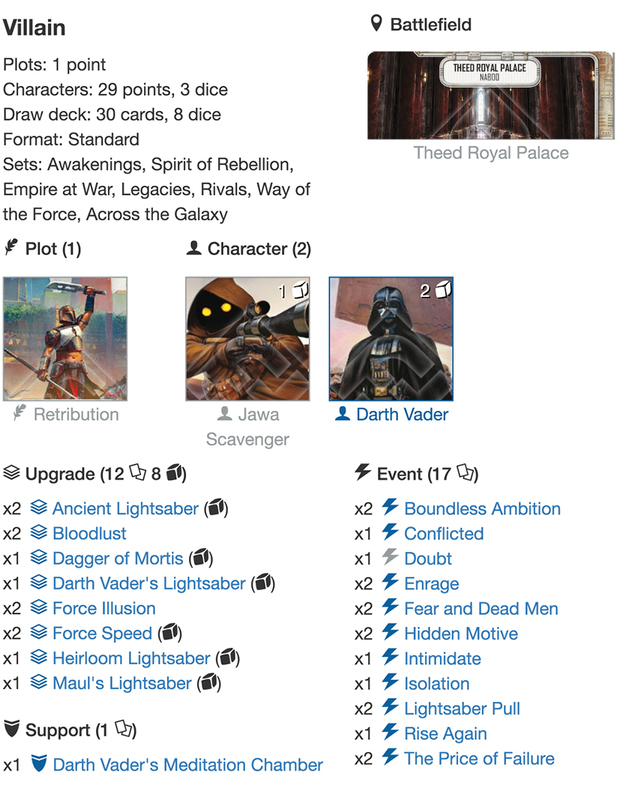 In the early days of Destiny, OG Vader/Raider was a superb list that was brutal to almost any other list going and probably ranks as one of the first meta deck of the game. For good reason. At 13 health he was a beast compared to a First Order Storm Trooper or any other lower HP characters, in fact only Palpatine had more. He removed a card when activating and his Melee sides were fantastic combined with a Lightsaber of choice. He romped tournaments across the globe, even taking down the first ever World Championship (2017), and Vader fans had a bad guy to be proud of... then he fell off a cliff. No meta play. No tournament play. Even Palpatine was being played at huge events this year. But no Darth Vader. Not even on the radar. The ultimate Star Wars villain was AWOL, presumed dead. Until Across the Galaxy got released and our new Big Daddy Vader is back...and wow was he worth the wait! At an enormous 15 health (an increase of 2) and a die that is 50% to hit damage, Vader3 simply as a character, knocks Vader1 out of the park. Yes, the 2 and 3 Melee sides are there, but while version 1 had a 2 Disrupt, a Shield and a Resource, our new best buddy replaces the Disrupts with a FOUR melee side for a resource! That is one of the most bonkers sides of any character in the game. In addition his Shield and Resource sides have doubled, so even a whiff will help you ramp further, play a great event, or even shield up his character to survive longer. Losing one card from hand was a great bonus, but the Power Action here is amazing. Say you have two dice showing Round 1, the 3 and 4 Melee sides. Your opponent plays Overconfidence and you re roll into a 3 Melee and the 2 Shield sides, removing the lowest side. 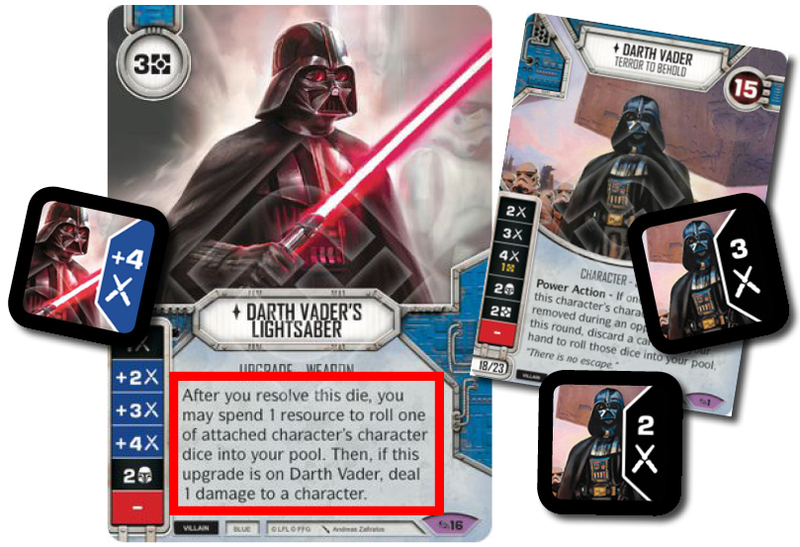 If one of Vader's dice were removed during an opponents last turn this round, discarding a card from your hand to roll ANY of those dice back into the pool is HUGE. Entangle him? Please. I will happily chuck a card away for the chance of 8 damage back in and their card being negated. As many decks are now running less and less events, to essentially have that card Stifled is not only scary but can be deadly to the other player. 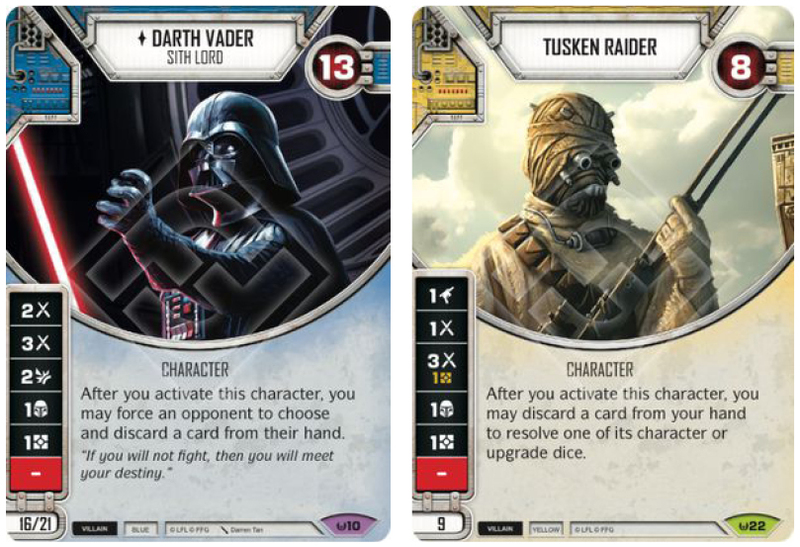 Good players will wait to see what you roll and try to mitigate his upgrade dice, but at an average of 5 a turn, even a naked Vader can rack up damage like a stock car racer! 3. WHO'S THE BEST PARTNER FOR VADER? At 23 points (elite) however, finding the perfect partner for him is a little tricky because 7 spare points does not leave a lot beyond a Battle Droid and a First Order Stormtrooper... just like my childhood pairing, so I started with those. 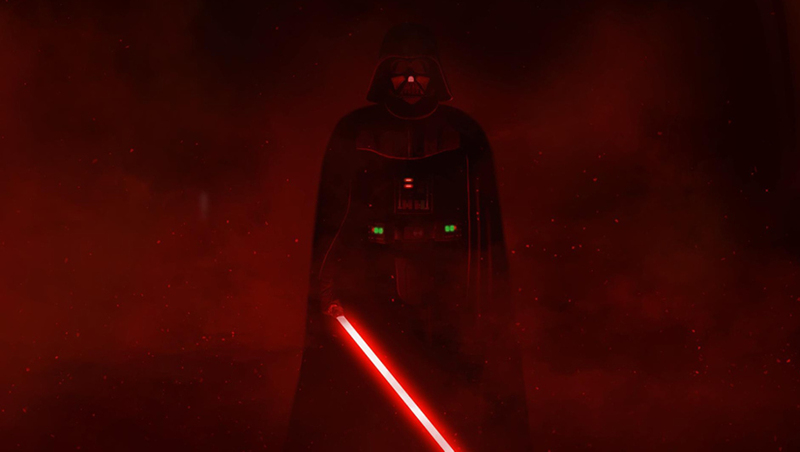 Red is not the best option for villain, unless you want to run ships which with Vader doesn't seem optimal. At 7hp the First Order Stormtrooper is squishy beyond belief and can be sniped off the board turn one. So how best to utilise Vader's little underling? So, The Best Defense... used twice nearly kills the trooper, but keeps your main character alive. In all Big/Little pairings, keeping your main damage dealer alive is critical so adding two here makes sense, as does adding two copies of Tactical Mastery, Probe and Logistics. Action cheating an extra turn, removing cards and making money to ramp Vader is a good thing. However blue sabers are key to Vader's success, most notably the most famous weapon in the galaxy, his own brilliant crimson blade of death. With only 1 base melee side it isn't great, but as a combo piece on Darth Vader himself, it is astonishing. +2, +3 and +4 Melee sides and 2 Shields combine with a resolve trigger. By spending a resource we can (if we used a base side on a Vader die) roll that character die back into the pool for another shot at more damage! In addition, if the blade is on Vader, we can deal 1 damage to a character as well. Free additional damage in a game AFTER dealing damage? Yes please, I will take that all day long. Do however expect this die to be negated, it is far too powerful on him to allow it to strike. Using one of the before mentioned Tactical Mastery cards or a Force Speed Special can really ruin the other players team, so try and remember to maximise your dice in the pool. Yet still this didn't feel good enough, so most people tried the old The Price of Failure trick. Killing off the Battle Droid or Stormtrooper to ready Vader, is a huge swing in variance that can send you well on the way to victory. 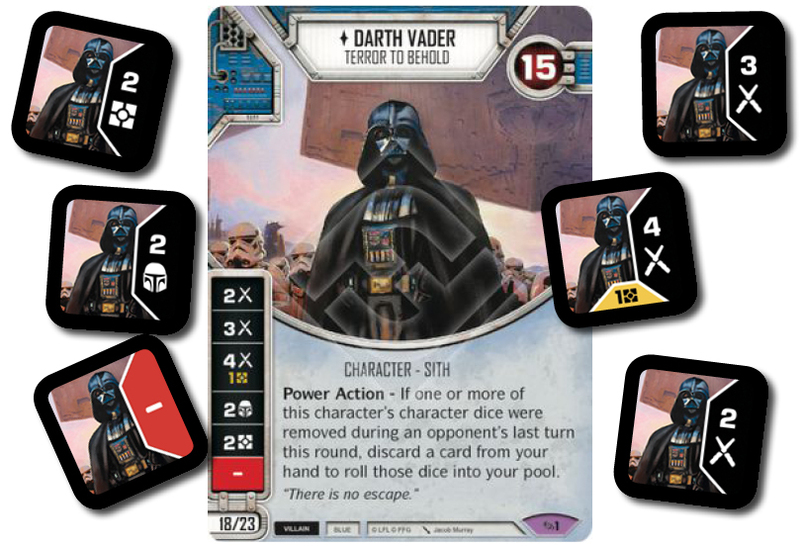 That double roll out in one turn, combined with hopefully a few cards to reroll with from Boundless Ambition can easily kill off their best hard hitter, leaving hopefully a tooled up Vader to mop up the remaining scrubs. It is always dangerous to kill your only other character in a pairing, but Darth Vader is so strong, the effect is almost always worth it. I do however stress - make sure you have cards to reroll with. There is nothing worse than using Price of Failure to roll a Blank and the 4 Melee/1 and have no resources or cards and you wasted the chance to inflict tons of damage! I AM GOING OUT ON RECORD HERE and as several blogs and podcasts are prone to do, make a prediction regarding Worlds 2019. In my opinion (with another full set to be released as well remember) will be a deck using a plot will win the event. Honestly. 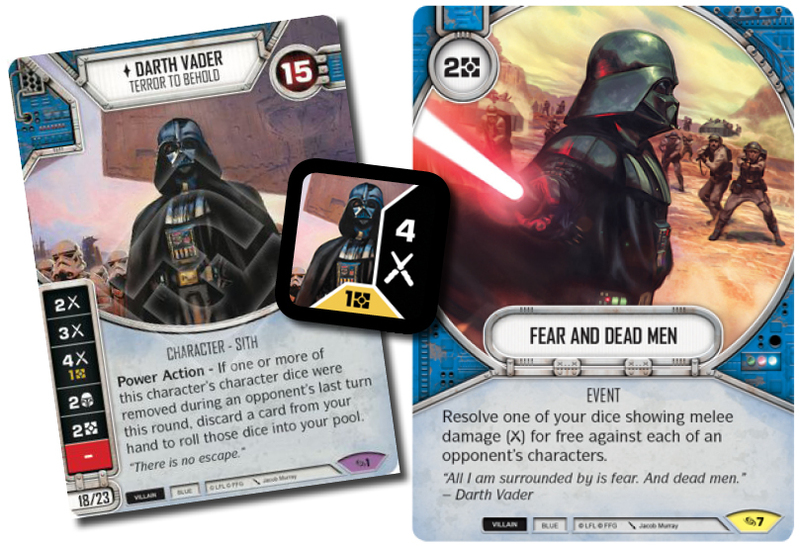 FFG are increasing their amounts of plots per set, and in Across the Galaxy, Vader has access to at least three superb plots to aid to the Dark Side finally taking over! The first one that caught my eye was in Jeremy Zwirn's list to combo Vader with elite Snoke, and Solidarity, a -1 team cost for mono decks but restricts you to only 1 copy of each card in your deck. With Vader's dice being so important, starting with only 1 seems to restrict yourself. Yes he added in Way of the Force, the 3cost upgrade to make that character elite, but even after i tested it, it seemed to fall short. But the PLOT I fell in love with, it is a whole new way to build decks and more importantly, how to play Destiny. 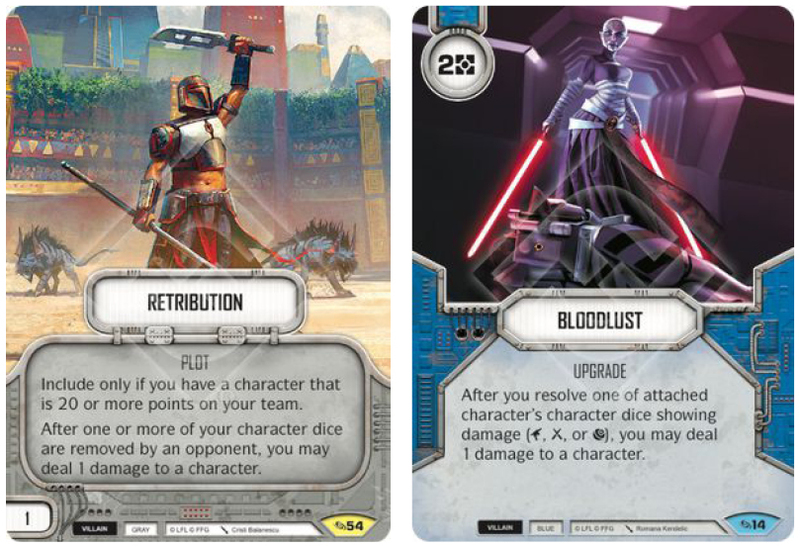 Early rounds now, if we have 5 dice out showing no damage, but the chance to hit for enough to kill a character and an Ancient Lightsaber in hand, we would think is the reroll for damage worth pitching this superb card for? Personally I would pitch and YOLO here. But what do you do in a Solidarity deck? Do you do? It's the only Ancient Lightsaber in your deck, and the value of the +3 Melee side and the two heal could be critical next round. Maybe I don't pitch here and move on. So I decided to see what other plots were available and Bitter Rivalry jumped out at me that both Nute Gunray and as here with Ciena Ree were available choices. Bitter Rivalry allows your opponent to deal 2 unblockable damage to one of your characters AND draw a card, so Round 1 they are at a considerable advantage. The payoff is a 31 point team of doom and destruction. Ciena here is a money making machine, and can even chip in with a damage or two before her inevitable demise at the hands of a Price of Failure. In addition she has more health than both the Battle Droid or Stormtrooper, so acts a meat sponge for longer. But as she is a unique character we can Leadership her twice, using Vader to his fullest destructive effect up to three times in the match! Even with only one upgrade Vader can hit like a truck and resetting him just makes people sigh with disappointment. The addition of Electrostaff to negate his pay side is huge! A 4 Melee side for free is just amazing on Vader. Again good players with negate that die but if they don't go to town. Key cards (as in all Price of Failure decks) are Boundless Ambition and Force Illusion. Use the former to reroll hard and the latter to stay alive, while FEAR AND DEAD MEN is maybe the best Blue villain card of the set. Pay 2 resources to deal the 4 Melee/1 across a 3wide deck? Yes I believe that is a superb payoff. 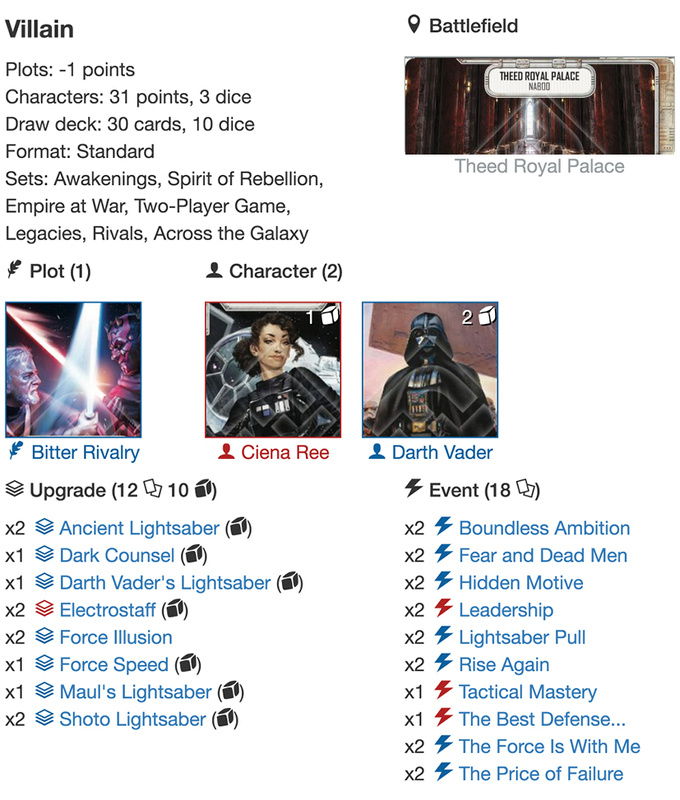 Dark Council is there to help focus your dice to their best sides and a single copy of Force Speed to make things even more unpleasant and this deck is not hilarious at all to face. 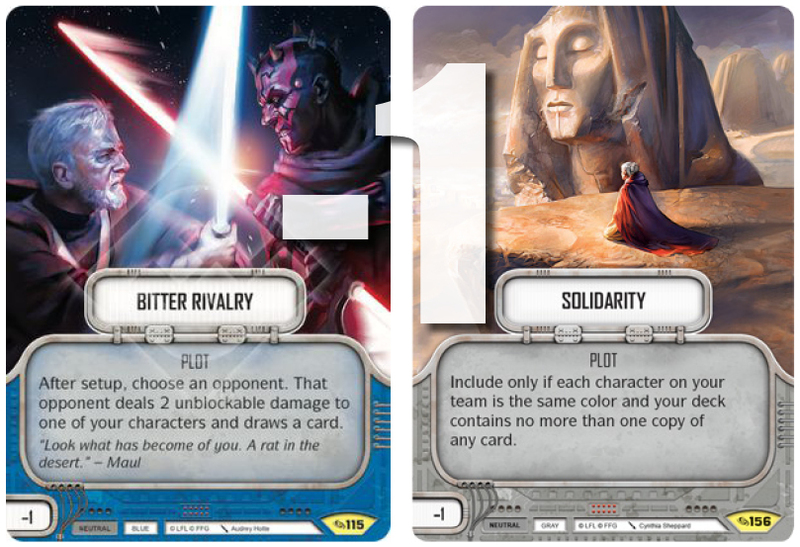 Nute as the other partner in crime stops their money and the 2 Disrupt side can stop them paying for events or upgrades themselves, potentially halting their game plan stone dead for a whole turn. With access to Yellow cards we have several options. 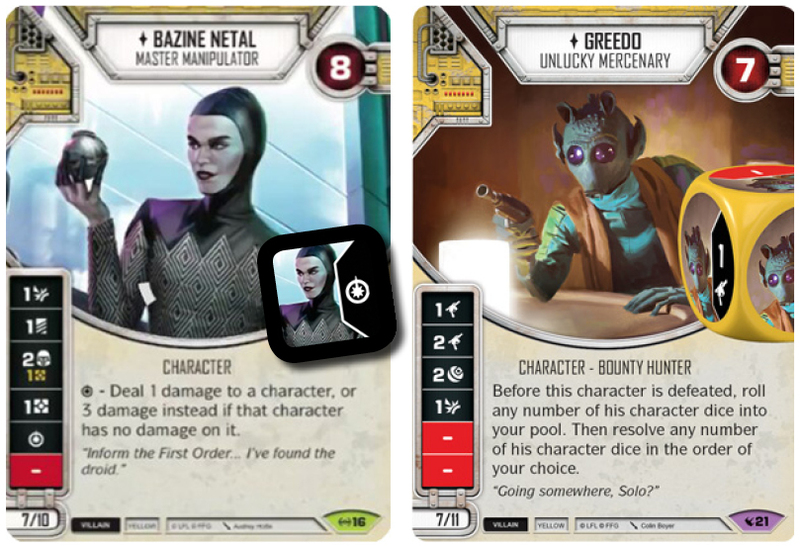 In various Discord channels many people are hard on the fence on either Greedo or Bazine is the ideal partner. In the above graphic I have a Greedo deck. Yes, we all know Han shot first, but in Destiny, Greedo certainly shoots last. He is very low in health, 7hp, but his sides that aren't the blanks are solid enough. He, like Ciena Ree, can chip away, plinking little bits of damage before his ultimate demise. But having Yellow is great. Bait and Switch is hilarious to bounce a Vader side to the 3 Melee and resolve, and Friends in Low Places will let you know their hand. Check to remove what event you can and play around their other dice mitigation cards. Truce, for the ambush and money sets up death plays and that replaces Enrage from the other decks. However using Bazine has huge advantages as well. Her Special side to hit for 3 damage on a untouched character is a massive hit for a support trooper. Even used twice she alone has hit for 6 total damage and hopefully taken a bit of damage herself. As you may have noticed, we want damage into them and as much as possible before cursing their bones and ending their existence. Any and all damage away from Vader is great and the main plan of Vader OTK decks. As a small aside, there are random people chiming in that Bala-Tik reset could be key. Maybe....but that deck is 5dice villain and not here. Remember the mantra. Use until useless then kill them. We want a Vader reset not the small resetting! Test with both and see which feels better for you. In the above deck I would almost add the Darksaber to add to Vader's killing potential, maybe even dropping It Binds All Things for it. Finally, what if I told you that a Jawa was good? Like really good? 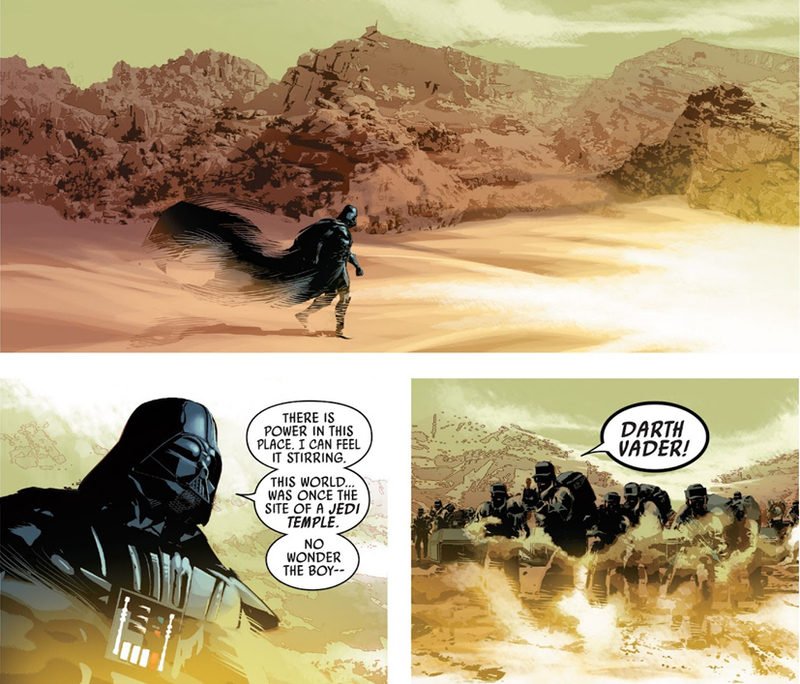 Key actually to making Vader work? Mad man or crazy fool I hear you think. Well maybe not. Jawa at 6 health and neutral is NOT a good investment, but again plots and events can help the Terror to Behold maybe want an alliance with the sandcrawlers. Retribution is one of those plots. Neutral, if we have a character of 20 or more points (which we do!) after one or more of our character dice are removed, deal 1 damage to a character. 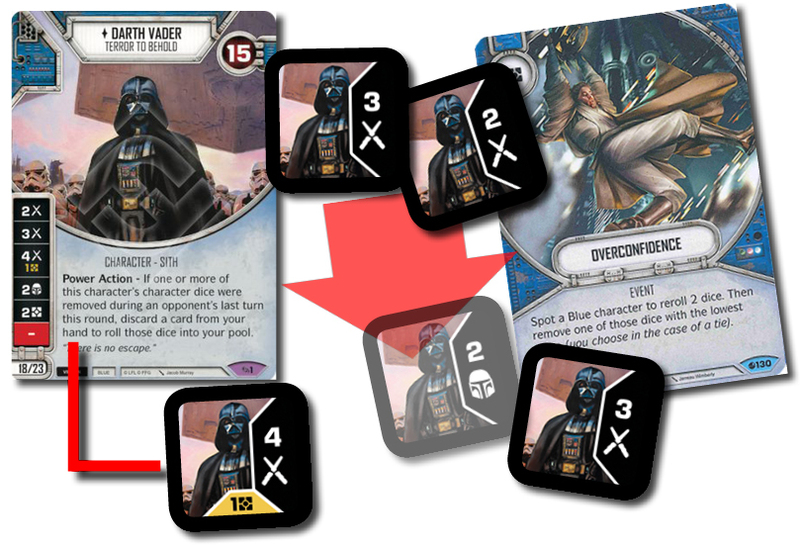 Throughout this article I have spoken about upgrade die being flipped or removed as Vader's Power Action is too bonkers to mess with. Sometimes in sheer desperation you have to remove his dice to stay in the game. Sadly here not only do I roll it back in, but I hit for a damage straight back before I do! The plot acts a mini lightsaber throw at half power, but combining it with Bloodlust is one sick, nasty combo. A 2 cost upgrade, after resolving a character die showing damage, I can AGAIN deal one damage to a character. Now I have Lightsaber Throw on tap for a cost of two. To make matter worse, Vader's Meditation Chamber just keeps him alive longer, while taking a card from your discard pile and adding it to the bottom of your deck! Healing ANS anti mill tech? Jebus! Spotting Vader allows all this and the ability to draw a card, a huge mechanic that seems very strong in the Across the Galaxy meta already. 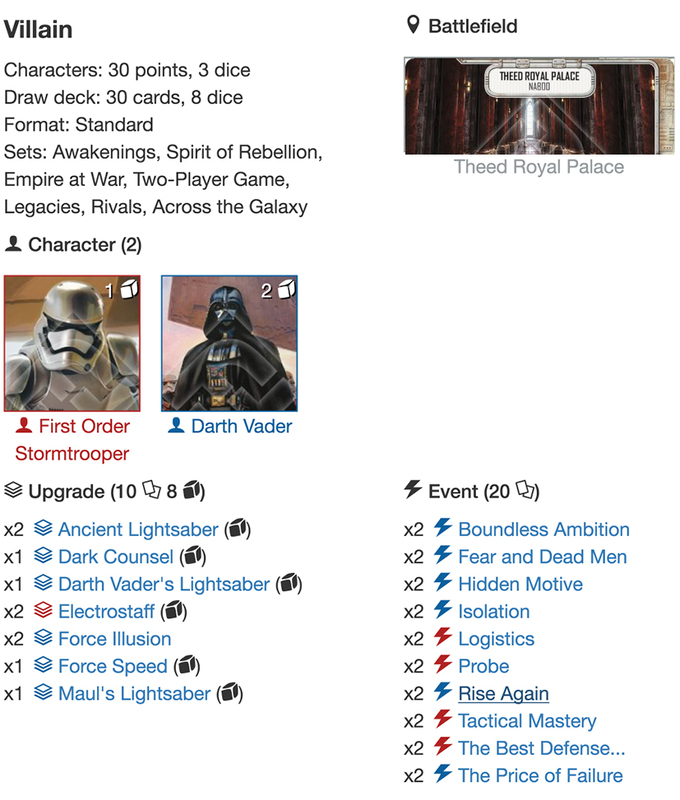 In every deck I have posted the battlefield is Theed Royal Palace. I just love battlefields and with people like Rex etc claiming or Ground Battalion decks using their text to have the field to ruin our day, Theed is precious to Vader and really helps in many ways. For a start, it is the only battlefield to have its own Power Action. Gain a resource. Boom. But in the Jawa deck it becomes a Grey Truce. Spot a neutral character to take one additional action. My 4 for a dollar my +3 on ancient and Mauls just killed your last character. GG man. Well played. The battlefield is becoming more key to winning games than ever before. 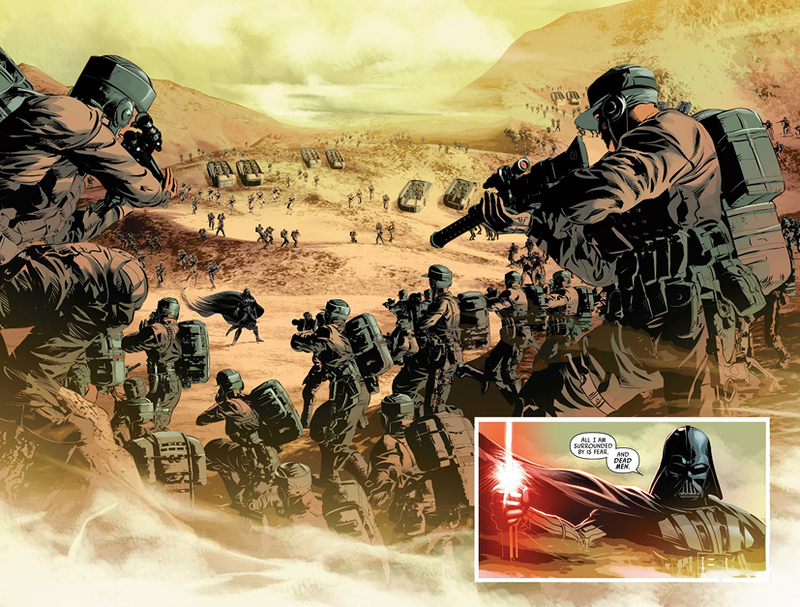 We want this Battlefield, but if not just shield up Vader and go to town swinging. Even in games when The Price of Failure fails to appear, or after killing Ciena you see your Leaderships, just pitch to reroll and hit hard. The Vader/x deck's ability to spike damage turns, although by no means consistent, it does happen in the game. Versus a two wide set up it is almost unfair. Will Vader3 be a tier 1 deck? No! I have tested the dude to pieces. He is fun, kills things well and on his day can beat anything set in front of you. But as consistency is the key to winning premier events, sadly at the moment, he can't bring that to the table. Who is his best sidekick? Right now I'm loving Jawa, with Ciena and Bazine close second. As future sets appear though, and new low cost characters that suit him better, he may become the most deadliest villain who doesn't like sand of all time. 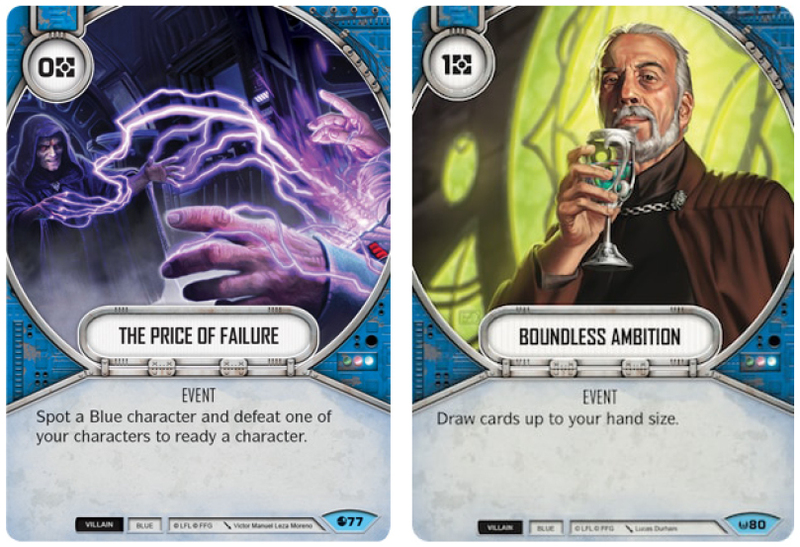 If you are also mulling over all your new cards from Across the Galaxy and trying to figure out how you can get the best out of them then remember to check out the full Across the Galaxy Set Review on this website! It's really an amazing tool for anyone who wants to get ahead of the competition!